Be careful what you share online about that test you just took. You just finished taking your college entrance exam. After months, or even years, of preparation and hours of testing, you’re glad it’s over. Elated is more like it. You’re both exhausted and keyed up, your mind churning. Don’t press “Send” just yet. Before you talk about any commercial standardized test on social media, there are a few things you need to know (starting with the fact that the cell phone in your hand is not even allowed in the testing center). Recent controversies over students sharing exam content on social media have brought to light issues related to test security in the Internet age. One incident in particular has caught the public eye: A student’s tweet of an item from the PARCC Common Core test was observed by the test publisher, Pearson, which contacted the New Jersey school district where the student attends. Some administrators, parents, and no doubt students were surprised to learn that Pearson was watching for such test security breaches on social media, and were equally surprised that the company took action. Sharing test information on social media can have serious consequences. Here are some realities you should be aware of. Testing companies have strict rules about test security. Sharing of test questions or answers is prohibited at any time. Never give questions or answers to anyone or discuss them by any means (e.g., email, text message, exchange via the Internet, or any other form of communication). There is never any point in time at which you are allowed to discuss exam content unless it is released as part of a College Board service (such as the Question-and-Answer Service). The use of phones and certain other electronic devices is prohibited in SAT test centers. More about the College Board’s phones and electronic devices policy can be found here. The rules at ACT — which publishes the ACT, ASPIRE, and WorkKeys exams, among others — are similar. What you consider innocent chatter about the test you just took might be considered a test security violation by the testing company. Any mention or description of specific exam content — reading passages or other stimulus material, writing prompts, questions, answer choices, etc. — is likely to be crossing the line. Keep in mind that sharing test items without permission not only violates the company’s test security policies but may also break Federal copyright law. You may think you’re just talking with your friends about that test question, but if you type it into social media, you’re actually publishing copyrighted material to hundreds of thousands of users of that social media platform around the world. (For example, as of this writing, Twitter has 288 million active users.) This is serious stuff. Most organizations of any considerable size — not just testing companies — with a social media presence use monitoring tools to track any mention of their brands and products, as well as key terms related to their business market. The largest companies have social media “listening rooms.” (For example, you can read about Gatorade’s social media “Mission Control” room here.) ACT and the College Board are most likely listening, too. Unless you have your social media accounts locked down with the strictest of privacy settings, there’s a good chance that anything you post can be viewed by others. Even if your posts are hidden, there’s no guarantee that your friends won’t share them and that the original post won’t be traced back to you. The best approach to social media use is to assume that anything you post is public or could become public, and that once it’s out there, it can’t likely be reeled back in. Breaking the rules can have serious consequences. If you bring a prohibited device (cell phone, ipod, etc.) to the testing center, you may be denied admission. If you are caught using a prohibited device while at the testing center, including during breaks, your device may be confiscated and inspected. You can be dismissed from the testing center and your scores withheld or cancelled, with no fee refund or option for appeal. If you are caught sharing secure test content at any time, the results can range from score cancellation to legal action against you. You may also be permanently barred from taking any of that company’s tests in the future. Testing companies say that their utmost concern is protecting the integrity, validity, and fairness of the test for all students, and this is likely true. But also in their minds is the fact that they invest considerable amounts of money to develop each test item, and they may go to considerable lengths to protect their intellectual property. The recent controversy over social media and the PARCC test has raised questions about student privacy, test security, and free speech in relation to standardized testing. 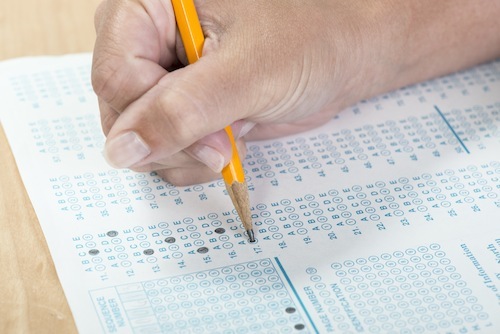 While many have opinions about these issues, particularly as standardized testing grows more controversial, the question you should ask yourself is whether you want to spend your junior and/or senior year dealing with the consequences of breaking testing policies. When you take the SAT or the ACT, you sign a document saying that you won’t reveal information from the test. Your signature legally obligates you to honor that promise — even with your friends. Treat the test with respect, and save your social media tweets for other topics, like celebrating your score report when it arrives in your mailbox.